MAYSVILLE (Scrap Monster): When you’re at the grocery store, you usually have a choice between paper or plastic. But, when it comes to the Metro government, there’s only one option. 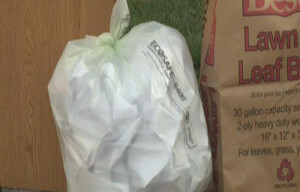 Mayor Greg Fischer reminded residents Friday that plastic bags are banned for collecting yard waste. The law took effect in January after a vote last spring by the Louisville Jefferson County Solid Waste Management District. With the new season in full bloom, residents who begin yard work will need to dispose of waste in either paper or compost bags or reusable containers. Fischer says about 80,000 Louisville households, more than 85 percent are obeying the new rule. He urged the remaining 15 percent to “get on board” with the regulation. “Before this new rule banning the plastic bags and improving the environment, Louisville was putting 32,000 tons of yard waste into the landfill each year. That meant costing more of your city budget money than we should have and we were using up limited space in the landfill and missing an opportunity to benefit using yard waste to make compost and beautify our community at the same time,” Fischer said. Mayor Fischer says until now, the plastic kept MSD from recycling the yard waste because it was too hard to separate from organic materials. If you continue to use plastic bags, it won’t get picked up. MSD will likely slip you a reminder about the ban. If that doesn’t work, residents could receive a fine of up to $100.